Israel is the heart of the Jewish people, Jerusalem is the heart of Israel and the Temple mount is the Heart of Jerusalem. I can offer absolute proof that is true. Sunday is Yom Yerushalayim, the anniversary (on the Jewish calendar) of the day Israel recaptured the Old City of Jerusalem 48 years ago on the second day of the Six-Day-War. I often read with curiosity how mainstream media reporters with Christian backgrounds describe the site as “what the Jewish people SAY was the location of the Holy Temples." I wonder when those folks go to Church on Sunday do they argue with their Priests and Ministers to change the Gospels? After-all Jesus who they believe is the son of God went to that Temple Mount and visited that Temple 3x a year as commanded by God, for each of the Jewish festivals; Sukkot, Passover, and Shavuot. But the purpose of this post is not to argue history or tradition, not to make jokes about the the fact when Muslims in Israel face Mecca to pray, they are mooning the Temple Mount (although it’s true). No discussion about how Moshe Dayan was the villain of the mount etc. I don’t have to argue about ownership of Jerusalem because I was there. And as corny as it may sound to anyone who has never been to the holy city, I felt the presence of God there. Yes I know that the Lord is everywhere, but Jerusalem and especially the Temple Mount feels different. All my life I had this overwhelming desire to go to Jerusalem and especially the Temple mount. I never understood that urge until I stood in its presence a few years ago when my family and I finally took a trip to Israel (my wife had been before but it was the first time for the rest of us). As soon as we drove through the hills and I got a peek at Jerusalem (from very far away) everything changed. For the first time in my life I felt comfortable in my surroundings. Jerusalem felt like home to me, despite the fact that I had never been there. Strangely I knew where to go and how to get around this holy city without looking at a map. There were times that I would tell my family that I had a shortcut to travel where we needed to go, and my wife who had been there before would tell me I was crazy (which was true but irrelevant). I was always correct. Everywhere I went, I knew where we were and its relation to the Temple Mount. And the closer I got, the lure of the Temple site was stronger than ever before. Now at this point, anyone reading this who has never been to Israel is probably calling for the guys with the nice white jackets with long sleeves that tie in the back to take me away. But before you make that call, ask anyone who has been there (anyone who believes in God) and see if they felt any different than I did. On our second day in Jerusalem, we were finally going to the Kotel (the Western retaining wall of the the Temple Mount, sometimes wrongly identified as part of the actual Holy Temple, but that was on top of the Temple Mount). With rare exceptions the retaining wall is the closest any Jewish or Christian tourist can get to the Temple Mount (and if they can get on top of the Mount no praying is allowed for non-Muslims). That law was created by the Israeli Government to keep the Muslims happy. The whole family got up early, I packed up my Tallit and T’fillin and took off with our guide into the Old City. Yossi, our wonderful guide took us all over the Old City, He knew how important the going to the Kotel was to me, yet rather than go directly to it he teased me with, “Its right over that wall, we will see this movie first, lets go to the burnt house etc” I was getting very frustrated, but he was masterfully building up my expectations. And I was not disappointed. When we finally walked down the wooden stairway and through the gate of the Kotel Plaza, I was overwhelmed by emotions that I had never felt before. All my life I felt this longing to go to the Kotel, and I finally knew why. You see, everywhere else you go in Israel, you can feel the presence of all that has gone on before you, King David, Avraham (Abraham), the 12 tribes, the two kingdoms and on and on. That is about culture and history. But when you visit the Jerusalem it is about God. It is about being able to feel the lingering presence of the Shekhinah (God’s presence) that left the Temple almost 2,700 years ago. That’s when I learned that the dispute over the Temple Mount was all political, it is all about delegitimizing the Jewish presence in Jerusalem. Because I was there. And with my son, then ten year old holding my bag, I celebrated my life long dream, I wrapped the T’fillin around my arm, placed it on my head wrapped my Tallit around my son and me, opened our siddur (prayer book) to the Mincha (afternoon) service, and prayed to our maker. It felt like so much more than praying when I was at the Kotel, Those words of Hebrew seemed to have meaning like never before. I was it was connecting. Connecting with the God of Avraham, Yitzchak, and Yaakov (Abraham, Isaac, and Jacob). That “urge” I had felt all my life was more like an invitation from my Maker, “Come Visit so we can talk.” And while God is everywhere, for some reason only a Rabbi can explain, his presence much stronger in Jerusalem and especially at the Temple Mount. There–that’s it, that’s my proof, that's how I know that the Temple Mount is Jewish. 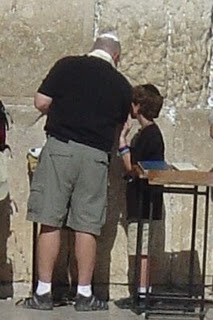 Nothing scientific, nothing that will work in a court of law or in an international dispute, I felt this strong connection to the Lord at the Kotel. And since my last visit to Israel I miss the Kotel more than anything. There is not another place in the entire world that can come close. Where did that connection originate? There is something in the DNA of a Jew that acts like a homing device. Just as a compass always points to the north, the heart of a Jew always points to Jerusalem.